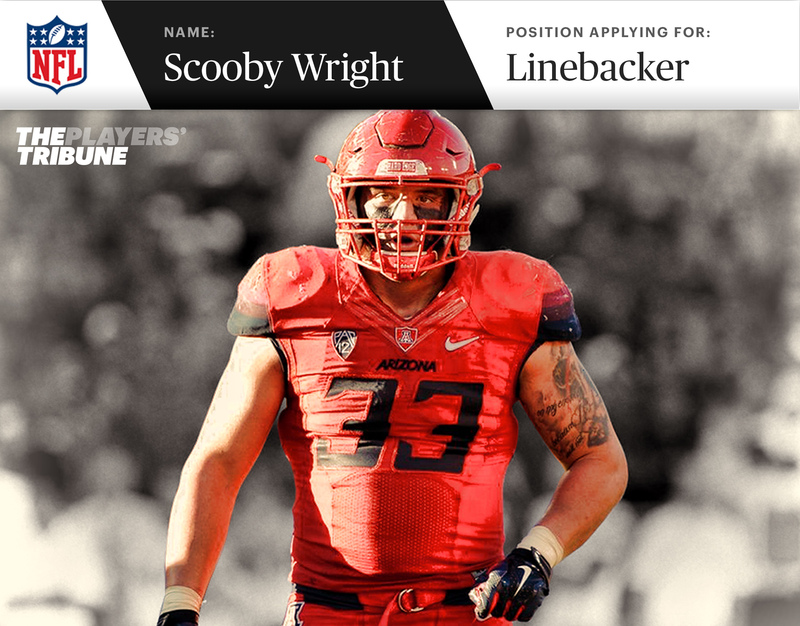 My name is Philip Anthony “Scooby” Wright III. I’m writing to express my interest in playing for your football team. Throughout my career, many coaches and teams have overlooked my talents, as if my production on the field was just a fluke. I get it. If you see me in street clothes, you might not think I’m the next great NFL linebacker. But when you see me on the field, you’ll probably think differently. At Cardinal Newman High in Santa, Rosa, Calif., I was a four-year starter on both sides of the ball and a two-time all-state selection. Yet scouting services ranked me as just a two-star recruit. That rating basically means,Yeah, he can play well against high school kids, but how will that translate when he moves up a level? Not bad for two stars. Now, as I prepare for the NFL draft, some scouting services are projecting me as a fourth-round pick. Yeah, he can play well against college players, but how will that translate when he moves up a level? Honestly, I love it. It makes me stronger. What the doubters don’t realize is that they fuel my motor. And my motor is what’s going to make me a great NFL player. So I’m looking forward to joining your team, because I’ll have the opportunity to play against 31 other franchises who are going to be kicking themselves while we absolutely dominate. Put me in pads and ask me to lead your defense, and there’s a lot of evidence that I can help you win. Now I’m aware that you may not have been totally impressed by what you saw from me at the NFL Scouting Combine. I wasn’t impressed either. In my mind, I totally underperformed. But my main goal for the combine was to prove that I had recovered from the torn meniscus and sprained ankle I suffered last season. In that regard, I was successful and I’m as healthy as I’ve ever been. Look, I’m a football player, plain and simple. Put me in sweats and ask me to run in circles around cones, and I’ll do an okay job. But put me in pads and ask me to lead your defense, and there’s a lot of evidence that I can help you win. How do I perform under pressure? Well, I was the signal-caller for the defense at Arizona. Against teams like Oregon, I’d only have 14–15 seconds between snaps to communicate a lot of information to my teammates. I’d have to get the call from the coach, share it with my team, look for any movements or audibles and then position myself to be the first person to the ball. And trust me, more often than not, I was the first person to that football. In October 2014, we played against Marcus Mariota’s undefeated Ducks on the road. Oregon’s offense was marching down the field with 2:23 left in the fourth quarter. Even though the moment was tense, my mind was clear. When I’m on the field, things slow down for me. It’s my domain. I remembered the advice our defensive coordinator, Jeff Casteel, gave us before the game: When you’re even with the quarterback, he’ll try to escape and run, so take a swat at the ball. So the next play, after bull-rushing the left tackle, I chased Mariota from behind, reached for the ball and caught all leather. I was ready for that moment. I proved myself as a true freshman when I moved up from third on the depth chart to starter after just three weeks of camp. I proved myself as a sophomore when I had 18 tackles and two sacks against Cal’s high-powered offense. And today I’m ready for the NFL. Some childhood friends often joke with me, saying, “Scoob, if only people knew you aren’t as cool as you’re perceived.” I’m not a wild guy. There is no ego that you will have to deal with. As a student at the University of Arizona, I was fine walking to my philosophy class in just a T-shirt and basketball shorts. There’s not much flash there. But between the lines, I will be your workhorse. If you want me to be an inside linebacker, I will do it. If you want me to be an outside linebacker, I will do it. If you want me to crush people on special teams, I’ll do it with a smile on my face. I’m a good football player. That’s a fair assessment. But the main reason you should draft me is because I’m going to get better — much, much better. Because I won’t think I’ve “made it” just because I’ve been drafted. I think that means the work is really just starting. Coach Casteel, the only Pac-12 coach to recruit me, had a vision for what type of player I could be. His instincts were right. So when he tells me that I haven’t even sniffed my ceiling yet, I trust his judgment. I’m going to reach my full potential on someone’s team. I think it’s in your best interest to make sure that it’s yours.